It’s been a while since we posted another Tag your friends picture, so let’s conclude this week with another one of these popular Facebook posters. 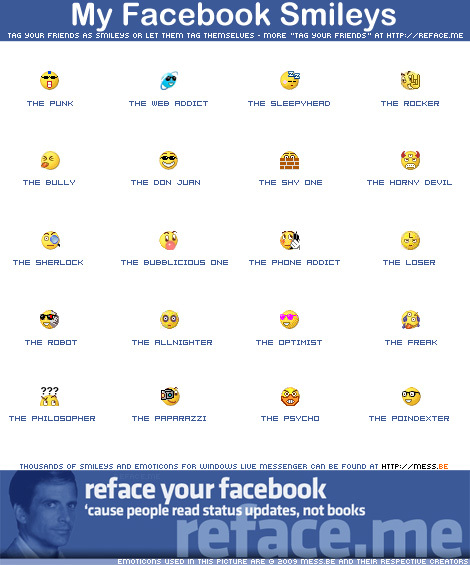 No cartoon characters in this picture, but a collage of smileys (or emoticons) instead. You know, those yellow things you’ve seen on forums and instant messaging software? 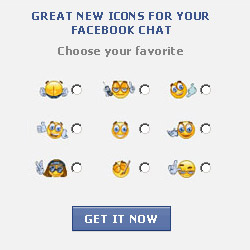 We selected the best of the remixed Windows Live Messenger emoticons that were uploaded by visitors of our sister site Mess.be (which is all about Windows Live Messenger). So what are you waiting for? Get your tagging on! Oh, and keep an eye on reface.me for more Tag your Facebook friends pictures! Posted by Pieter on March 8, 2009 at 6:45 AM. Use this trackback if you're linking this story.